A small inter-electrode gap is necessary to improve the machining accuracy in electrochemical machining (ECM). In order to achieve a stable small gap processing, this paper proposes a new concept of ECM method with a floating cathode. Aiming at the problem of gap regulation in this method, the modeling and experimental research are carried out, taking the electrochemical machining with a large span floating cathode of dual round outlets for rotary parts as an example. 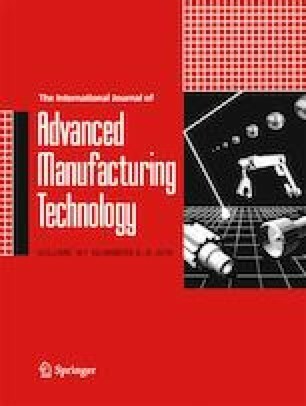 A mathematical model of machining gap is established based on fluid mechanics and kinetics of electrode processes, from which the relationships between the gap and process parameters are analyzed. Through the experimental method, the influence law of the variation of process parameters on the gap is further studied, and the mathematical model is modified. Comparisons between the modified theoretical model calculation results and experimental results show that considering only the flow field conditions, the average error of the inter-electrode gap obtained by experiment and model during work-piece rest and work-piece rotation is 6.1% and 4.3%; considering the flow field and electric field conditions, the average error of the inter-electrode gap during work-piece rest and work-piece rotation is 4.1% and 5.1%. The study demonstrates that a stable inter-electrode gap can be formed in ECM through the liquid electrolyte to support the cathode, and the inter-electrode gap was correlated with the electrolyte flowrate, current, and electrolyte pressure, so it is a feasible method to regulate the gap by adjusting the electrolyte flow or the inter-electrode current during processing, which provides a new way for gap formation and control in high-precision electrochemical machining. This research was supported by the National Science Foundation of China (51675072 and 51275062) and Liaoning Province Million Talents Engineering Finance Project (201569).